We prefer to use reusable water bottles in our home because it’s better for the environment and cheaper. You may have seen my review of the Nalgene on the fly and multidrink water bottles. Now, Nalgene has a new line of bottles out called translucent. Nalgene translucent water bottles are perfect for the gym or even on the go. These water bottles are tough and Nalgene guarantees them for life! I love that the caps are attached to the bottle so you don’t have to worry about losing it and they screw and unscrew quickly and easily. They are dishwasher safe and BPA free! My favorite thing about Nalgene bottles is that they don’t hold onto odors or tastes. I hate when water bottles get that gross smell to them after a while and thankfully Nalgene bottles don’t do this. Nalgene bottles are also made in the USA! The Nalgene translucent bottles are available in both a wide or narrow mouth style and you have your choice of 16oz or 32oz. I prefer the narrow mouth but Daddy Digger prefers the wide mouth style. They come in a variety of fun color combinations and would make a great stocking stuffer gift for the fitness guru! 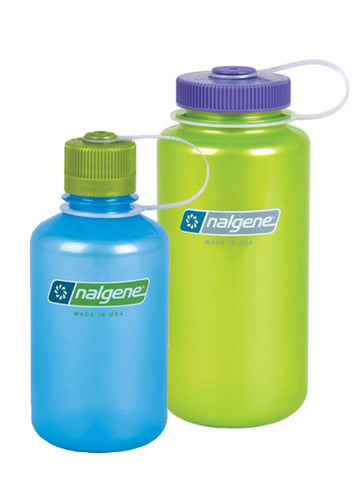 Nalgene Translucents are available for purchase at www.nalgene.com, $9 for the 16oz and $10.20 for the 32oz. I received Nalgene translucent water bottles for the purpose of this honest review. All thoughts and opinions are my own. This post was written by me and not edited by anyone. I like the glow green or blue colors. Thanks for the giveaway…we like “Frost” .